South West Cornwall is full of interesting places to visit, most of the area is classified as being of "Outstanding Natural Beauty". The sandy beaches, rugged coastline, wildlife and ancient man made features make for a busy agenda - free of charge of course. Also, there are numerous all weather attractions, catering for the young and no so young alike. This page highlights some of the area's natural and less known attractions, as these tend not to market themselves! The geological structure of the area surrounding Helston is very rich in tin ore, the mining of which brought considerable wealth to the area several hundred years ago. This resulted in the construction of several houses of national importance, including Godolphin House - which is in walking distance. Many a solicitors office in Helston has a wall poster detailing the sale of shares in a mining venture dating back well over 100 years! The Godolphin Cross pub is very popular with our guests, it provides excellent traditional English Pub food. John the landlord has the balance just right - serving good quality traditional English pub food - whilst resisting the temptation to over complicate things. Godolphin woods is a popular and relaxing area in which to walk or bicycle. Up 'til around twenty years ago SW Cornwall boasted a fledgling Treacle Mining industry, in fact your host Raymond White was a director of one of The Lizard's largest mines, Trewiggey. Raymond along with fellow director Ben Roskilly developed the business - the London Guardian newspaper even carried a front page story of their success. However following the oil price shocks of the mid 1970's the industry hit a sticky patch and it became uneconomic to transport the end product. The exact location of the mine is now a closely kept secret. It's worth asking Raymond a few questions about his experiences in this exciting business - particularly if you can spot the primary distillation & separation coil around the house which Ray has turned into an object d'art (scale model of course). On your way to Marazion you will see the historic remains of Cornwall's tin mining industry. Raymond and Iris will gladly recommend a range of local restaurants, the area has a number of excellent fish restaurants as well as numerous traditional country pubs. We would also welcome your feedback, so that we can pass on new recommendations to other guests. 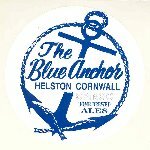 "Springo" has been brewed on site at The Blue Anchor in Helston for many years - it will certainly put a spring in your step! Helston is home to RNAS Culdrose which is one of the largest Royal Navy airstations in the UK, its annual airday (normally held in July) is a popular attraction. Just next door is one of Cornwall's best known & most popular theme parks, Flambards Village. Flambards contains an extensive collection of stationary aircraft exhibits and a recreation of the past. St.Ives attracts many visitors to its harbour during the summer. The recently opened Tate Gallery which overlooks St. Ives is also very popular. Mount's Bay is home to St. Michael's Mount, the small island which is joined to the mainland by a short causeway is the site of a medieval castle. Click here to view pictures of St. Michael's Mount and Mount's Bay. Interested in learning to Windsurf - have a look at Coverack Windsurfing Centre. Coverack has an active local Art Club, the local art gallery "The Mill Gallery" is well stocked. Try searching the web for local artists such as Mary Wastie, John Dyer and Tony Shorthouse. Many of our guests visit the Eden Project as part of their tour of Cornwall. The Eden Project is a 45 minute drive from our location, may guests have made an enjoyable day trip of visiting the Eden Project in the morning, one of the many public gardens in the afternoon and a local restaurant in the evening.